Mario’s green steed has seen more iterations than you may have thought over the years, with the best Yoshi games all leading up to Yoshi’s Crafted World. The assignment for the loveable dino named Yoshi is almost always the same: safely transport baby Mario and Luigi to their parents as Bowser, Kamek and co. attempt to steal the newborns. Mario and Luigi aren’t ever really of any help in the Yoshi games, seeing as they are nearly a day old. There are some titles in the Yoshi series that do not include a plot to rescue the babies of the Mushroom Kingdom, which can either be hit or miss. Deviating from the formula is sometimes a good thing, but the Yoshi series has at times struggled to find that happy medium between originality and not fixing what isn’t broken. While the Super Mario Bros. series features Yoshi on the boxart with Mario for Super Mario Advance 2, I’ve decided to only rank the best Yoshi games that feature him as the main playable character. This means that the fantastic Super Mario World: Super Mario Advance 2 won’t be included. I’m also omitting the side games that lack the traditional platforming elements of other Yoshi games, such as the Yoshi’s Cookie series and Yoshi’s Safari. As the Yoshi series continues to gain steam in the Switch’s Yoshi’s Crafted World, what better time to take a look at the history of the series to definitively decide which title is best? Yoshi is undeniably cute, giving some of his games more points based on their adorableness alone. 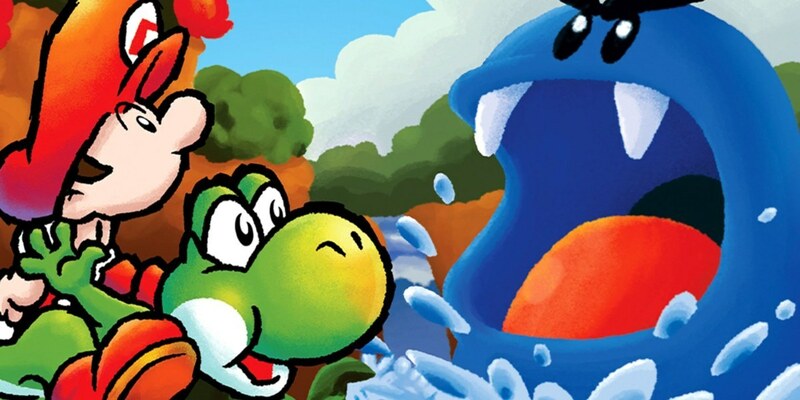 If you’re a fan of “hut”, “bah-riing!” and “bup!”, then look no further for the best Yoshi games ranked from nearly unplayable to timeless classic. I’ve grown slightly less bitter about this game as I’ve reached adulthood. As a child, I couldn’t understand why the gyroscopic controls weren’t working like I wanted them to on my Game Boy Advance SP. It turns out, all I needed to do was select which console I was playing on from the main menu screen. Huh. I doubt I would ever enjoy this clumsy and choppy game more than I did whilst playing it with mirrored gyroscopic controls. As is the curse with many a gyroscopic element in video game hardware, without any physical tension, it’s difficult for the mind to understand where one plane ends and another begins. That’s where Yoshi Topsy-Turvy falls flat on its face. It’s never really fun, because you’re so cognizant of how off the gyroscopic mechanics are that you can’t even concentrate on enjoying the game at all. There’s not a lot to analyze in this DS title, so much so that I nearly considered not placing it within this best Yoshi games ranking. It’s a weird middle ground between a side game and an evolution of the Yoshi’s Island formula. The touch mechanics work alright here, but they don’t really lend themselves to much exploration. Having no real control over Yoshi’s horizontal movement, players are instead challenged to draw out platforms and tap on Yoshi to time his flutter jumps. I’ve had a lot more fun playing other Yoshi games, and quite frankly, this one often slips my mind. That one game where you had to use both screens for Yoshi and it only had touchscreen controls? Wasn’t that just a Wario Ware mini-game? The music. Ugh the music. Look, I know what you were going for here, Nintendo, but using a kazoo as the main instrument for the game’s theme is baaaad idea. How are we supposed to take a game seriously when its OST sounds like it was performed by literal five-year-olds? You may think that I’m making a bigger deal out of this than I should be, but I challenge you to listen to the entirety of the track I’ve embedded below. I know. It’s distracting, and while it comes off as purposely elementary, it’s notorious. If you bring up Yoshi’s New Island to any Nintendo fan, they’ll immediately shudder at the thought of the soundtrack. It’s a shame too, because there are some really pleasant themes buried within the game, but it’s hard to get the taste of that kazoo out of your mouth once you’ve experienced its bitterness. What’s more, the game doesn’t do much to differentiate itself from Yoshi’s Island. While it’s not nearly a clone, it’s like a diet version of a far superior platformer from Christmases past. Think of Yoshi’s New Island like the La Croix of the Yoshi games: just palatable enough that you can finish if you power through it, but with a slight aftertaste of sulfur and disappointment. Yoshi’s Story was an example of a healthy attempt to create a Yoshi adventure that didn’t feel like a carbon-copy of the massively successful Yoshi’s Island. Featuring 3D graphics and a more grungey art style, Yoshi’s Story takes itself very seriously, and perhaps a little bit too much so. It’s the definition of a middle ground Yoshi platformer, with it not being so un-fun so as to warrant avoiding it. It’s just difficult enough to make it a pain to play through casually. There’s fun to be had here in this somewhat obscure Nintendo 64 title, and cute music to boot. It was an honest attempt at a fun Yoshi platformer, and for that, I give it a C+. Hey, would you look at that, a Yoshi’s Island clone that doesn’t completely reek! This less than rotten title makes for an egg-celent playthrough that doesn’t taste like failure, disappointment, rushed development, and sulfur. Okay, I’ll stop with the egg puns now. While not having much wrong about itself, it doesn’t do much to make itself stand out in the Yoshi series. It has some fun new transformations and egg powers, and introduces new Super Mario series babies that pair with unique powers for the green dino. If you liked Yoshi’s Island, rest assured that Nintendo heard you and made the closest thing to a direct sequel that you’ll ever see in this DS title. While still leagues above games like Topsy Turvy and Touch & Go, I hesitate to say that Woolly World is an amazing game. It’s a fun one, with neat unravel mechanics and somewhat interesting level designs. It also, ahem, crafts its own art style in an attempt to differentiate itself from Yoshi’s Island. For the most part, that works, but even sans the baby Mario plot, this title still feels like it relies fairly heavily on Yoshi’s Island. This is a great game, just not stellar. Play Wooly World if you’ve already beaten the first on this list (which should come as no surprise if you’ve already done the math here). Also play it if you want to have a lighthearted co-op adventure with a friend (but yeah, just like in the New Super Mario Bros. games, tread lightly… these co-op games can break up even the closest of relationships). Yoshi’s Island is a modern classic. Its unique hover mechanics mixed with state of the art (for the SNES) graphics made for an adventure that many will never forget. Often considered one of the best Mario platformers ever, Yoshi’s Island introduced the concept of being baby Mario’s bodyguard, which, as it turns out, is a lot more fun than it seems. When players aren’t desperately trying to grab back baby Mario before Kamek’s forces can take the toddler to Bowser’s Castle, the gameplay focuses on the subtle beauty of nature. Two distinct moments that stick out in my mind are the transition into the heavy snowstorm (so beautiful and scenic!) and the infamous “Touch Fuzzy Get Dizzy” level. Both areas showcase Nintendo at their best, making this a memorable platformer that is both fun to play through and look at. The presentation of the game is impeccable. It more than holds up in the modern age of gaming. Yoshi’s Island set the bar for both Super Mario platformers and crafted a sub-genre of a hand-drawn art style for video games. The music is iconic, the level designs are memorable, the transformations are exciting, the egg throwing is amazingly responsive, and gosh is it cute. If you consider yourself a platforming fan, go back and play this masterpiece of a video game. Where the incoming Yoshi’s Crafted World will place on this list is a mystery, but I hope it will land just below Yoshi’s Island. Yoshi’s Crafted World releases for the Nintendo Switch on March 29, 2019.